As part of the organization I started, Environmental Consumer, I built an application to help individuals reduce their time in the shower as part of a hackathon in early 2014. 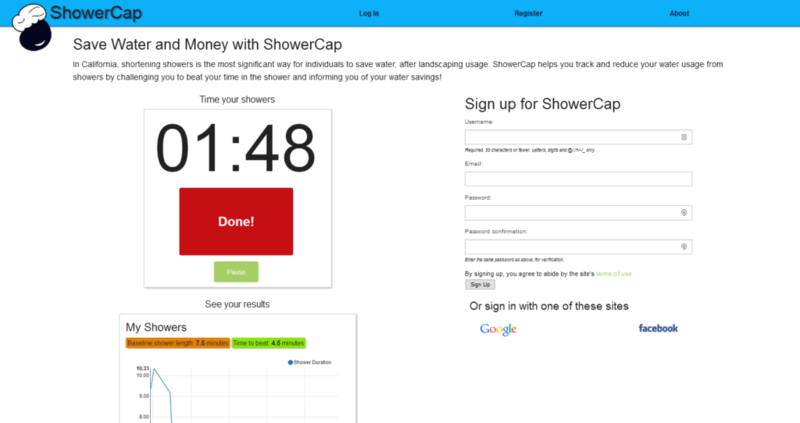 Designed specifically for mobile devices, the application lets you start and stop a timer, accounts for time to dry off, and then gives you a time to beat for each shower that is below your average time, in order to encourage you to shower faster. When you hit your time to beat during each shower, it plays a sound to let you know you’ve gone over and should wrap up quickly! The app then lets you chart your progress over time to see how your showers have progressed overall and how much water you’ve saved. The app is built in Django and uses a PostgreSQL database. On the front end, it uses the Foundation framework for responsive design and JQuery and NVD3.js (a graphing library that wraps D3.js) for interaction.